It if works, this concept could take off like an underground wildfire. A Native American-owned corporation in Alaska will attempt to see if coal mining and fragile ecosystems can coexist. 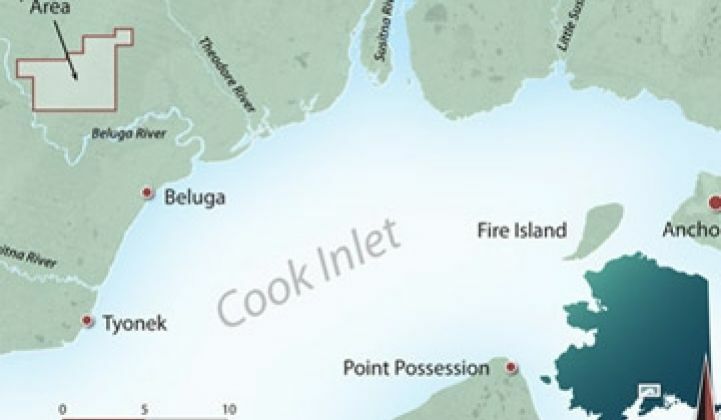 Cook Inlet Region Inc. (CIRI) is pursuing permits with Laurus Energy to build an underground coal gasification facility near the Beluga River in southern Alaska that will support a 100 megawatt power plant. In the system, gasification equipment will transform coal into a synthetic gas 1,800 feet or more beneath the ground. The syngas will then be piped to the surface to run the power plant, which will in turn provide electricity to local homes and businesses. "It would take less than three acres a year (of underground coal) to support a 100 megawatt power facility," said Ethan Schutt, senior vice president of land and energy development for CIRI. "We'd need less than 90 acres to supply the plant for its expected lifetime." Early core samples indicate that enough coal sits in the area to run several plants for thousands of years and, judging by pricing trends, the power will be as cheap or even cost less than conventional power in the region. Depending on the results and future economic circumstances, the gasified coal could conceivably be converted into pipeline-quality methane and exported. The key environmental benefit, however, comes from the underground nature of the coal conversion. The coal would not be mined. Instead, it would be converted through chemical treatments, heat, and pressure into a gas. The surface forest would not be disturbed much and waste products derived from the operation would stay underground. "All that ash and slag -- the solid waste stays where it started," he said. In-situ gasifiers like this are already in operation in South Africa and resemble "pipes in a pasture," Schutt added. Others have also suggested that the carbon dioxide from the gas-fired power plant on the surface could be captured and sequestered in the newly formed subterranean smoking hole. Considering the environmental concerns, above-ground coal mining in the region is untenable. A traditional mining company has been trying to get a permit for 25 years in the region, "and they are still years and years away," he added. CIRI, in fact, wasn't intently studying the prospect of coal mining; the underground project was developed only after independent cold calls from Laurus and two others planted the seed for the idea. But, like a lot of things in green tech, the details remain daunting. National labs and researchers have experimented with underground gasification since the 70s, and most of the projects have served to identify various risks and problems: groundwater contamination, leaking byproducts like benzene, seismic instability, and other issues. Laurus, which has received VC funds from Mohr Davidow, has in some ways lived through that history: its processes derive from technology originally created in the Soviet Union, one of the many countries that went out of business during the deregulation craze of the early 90s. Researchers now generally concur that underground gasifiers have to be built 600 feet or more below the surface, he said. At that depth, the facility and the earth surrounding it will have the structural strength to prevent subsidence. The different phases of the process -- which involve transferring hydrocarbons from a high-pressure/high-temperature chamber to a low-pressure/low-temperature chamber -- tend to work better deep below the surface. The quality of coal plays a role, too. Beluga River coal is actually somewhat low in energy content. Thus, if it were mined traditionally, it would take quite a bit of coal to run a power plant. The low energy content presents a potential stumbling block to selling it as natural gas. CIRI and Laurus will dedicate the next four to five years to planning, permitting and design. By 2014, commercial power production might begin. Although CIRI may not be familiar name, the group, which is owned by 7,500 shareholders of Yup'ik, Aleut, Eskimo, Alutiiq and Athabascan descent, could become one of the most successful VCs this year. It invested $10 million in biofuel specialist Codexis a year ago, and is also an investor in the Westly Group, the VC firm that owns a piece of Tesla Motors. Both Tesla and Codexis have filed the preliminary paperwork to hold IPOs. Two exits in one year? Kleiner, Perkins only got its first exit this week when Areva bought solar thermal specialist Ausra. CIRI also owns interest in several regional wind farms and one geothermal project, and is cooperating on a tidal power prototype.